One of the coolest parts of my new hobby is getting to know new people on social media. I am pretty active on Twitter and Reddit, and have met a lot of good bourbon folks on those sites. Another cool part is that it gives me access to pictures and reviews of spirits that I have not tried, or spirits that are new and not available everywhere. 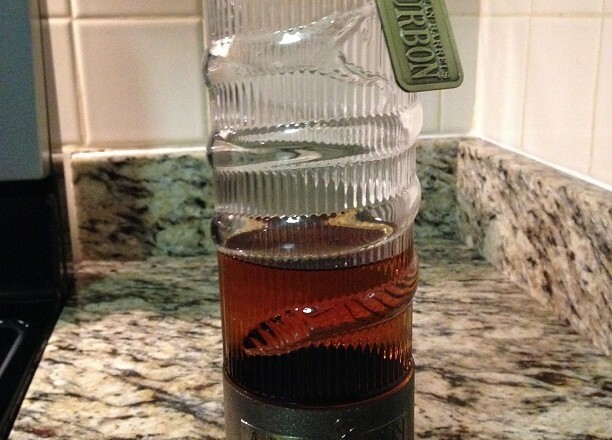 One night while browsing Twitter, a new follower tweeted a picture of what I thought was the coolest bottle of bourbon I had ever seen. It had a snake, a dog tag, a shotgun, and looked like a bullet casing. The name of the bourbon was American Barrels Bourbon Whiskey. All of that screamed ‘Merica like no other product I had seen. I had to try this stuff. I contacted the Twitter person and eventually I was led to Michael Reed, owner of American Barrels. I requested a small sample, I got a bottle. I was impressed, but I vowed to make my review honest, and not swayed by the more than generous sampling of the product. It was only fair to the company, and to people reading this, if I kept an honest opinion no matter what. I sampled the bottle a few times before sitting down to write this review. As I described above, the bottle is really cool. Michael Reed says he came up with the idea for the brand and bottle while at a bar at Indiana University. He says he designed it as a “shotgun shell wrapped in the iconic American rattle snake,” and that the name American Barrels represented “whiskey barrels and gun barrels, the two barrels Americans hold quite [sacred]”. It is a very cool looking bottle. I have to be honest, the first time I opened this bottle and gave it a big whiff, it smelled like Moonshine. The back of the bottle states that the bourbon is aged less than 2 years, and it was apparent in the nose. Grain alcohol mixed with corn prevailed on the nose, and maybe a little bit of caramel. Just to compare, I opened up my half empty bottle of Prichard’s White Lightning and took a whiff. Ok, that’s moonshine. This stuff just smells like a mix between moonshine and bourbon. After a few weeks open, the nose of the bourbon lightened up a little bit, but not by much. There is no depth to the smell of the bourbon, and is expected for such a young juice. When I first poured it neat, I was a little scared. I expected the gross, grainy, corn based rocket fuel flavor of Moonshine. At a minimum, I expected it to burn quite a bit, even if I got a taste of some bourbon in there. I took a sip and let it sit on my tongue for a second before swishing it around and swallowing. I winced and readied for the pain…and…it never came. I was pleasantly surprised. There was very little burn. Pecan, peanuts, and caramel were consistent flavors for me. As Michael stated, “It’s a young bourbon, but it’s filtered through a unique post – barrel refinement system that uses ultra sonic energy to remove the minor alcohols which results in a taste profile of a more mature whiskey, but as a bonus essentially double the smoothness and the removal of the hangover effect.” Now, I haven’t had a hangover in a long time, but regardless, I liked the idea of not having one. Though the taste is not bad, there really is no finish. There is a little alcohol burn at the end, but not much bourbon flavor. I think that is also a trait of young bourbons. There is no oak or caramel sweetness lingering after the fact that I have come to love with bourbons. 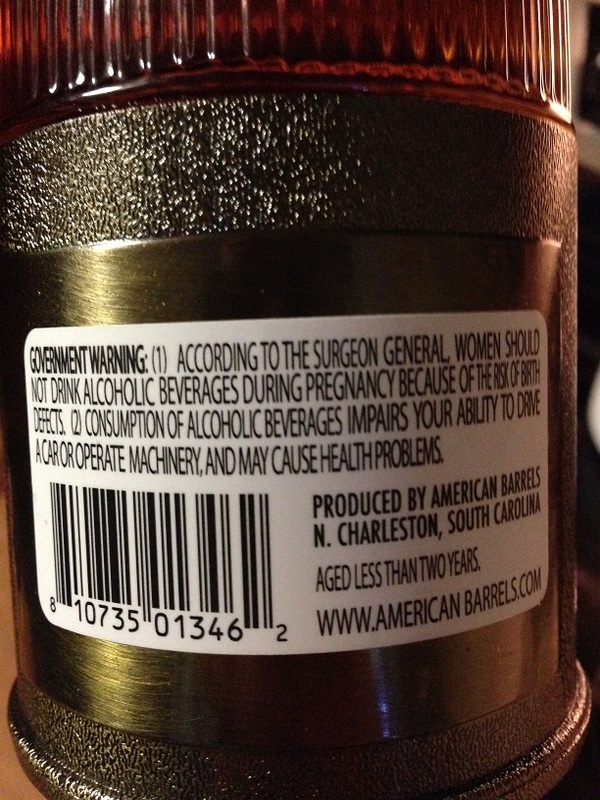 To be fair, American Barrels is not a sipping bourbon. At least not for me. I made a few mixed drinks with the bourbon and I can say that is where this stuff truly shines. It mixes well in an Old Fashioned, and in a Manhattan, and I even preferred it over Buffalo Trace. The nice smooth palate remains, but the mix of the drink removes the lingering alcohol finish. 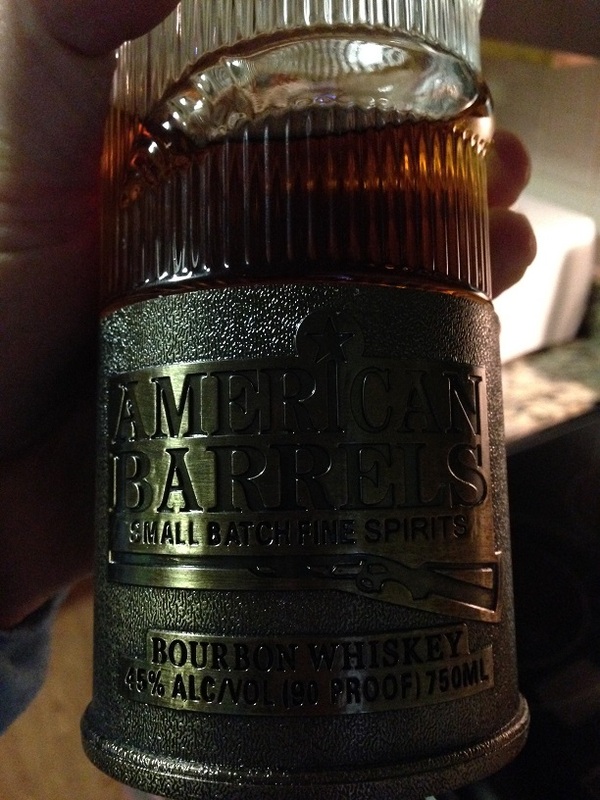 So in conclusion, American Barrels Bourbon Whiskey is probably not going to become a regular drink for me. It’s young, it lacks depth in smell and finish compared to what I usually drink. But this is a new company, with a new product, and I came away impressed. It’s a young product trying to compete in a world of 10+ year aged bourbon. How can anyone expect to come right out with a well polished bourbon and compete in the market place? It takes time, it takes money, and it takes a passion. Michael Reed with American Barrels has that passion. He will continue to improve his product and continue to expand. He has already produced a product that I prefer over a well-known brand name in mixed drinks. I expect good things from American Barrels in the future and I look forward to hearing about it’s successes in the years to come. Cheers to you Michael Reed, keep on fighting the fight of the little guys.